Do We Still Like Afternoon Tea? One of the things that I’ve always enjoyed on holidays is the ability to chill out on a lazy afternoon and just enjoy spending time with people I really want to be with. I don’t think tea is limited to just the afternoon, but it really does give the impression of sitting down with best bib and tucker over a plate of tea, scones, dainty cakes and cucumber sandwiches. When my kids were wee, I used to love taking them out and we often used to just stop off for afternoon tea. That’s something we’ve grown out of a little since they’ve got bigger, and it’s only now when I’ve written about it that I remember how much I actually miss that interaction and discussion time with my children. It’s just not the same going into a kids cafe or local greasy spoon for a cuppa. 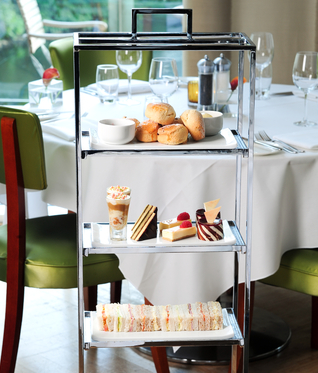 I used to work in an oil services company so I’ve had afternoon tea in many hotels with lots of plates of gorgeous cakes and sandwiches to choose from. It was more often called lunch than afternoon tea, but it was 100% afternoon tea. When I visit my dads girlfriend in St Andrews, she always takes me to a hotel for tea and it seems to be a staple in her crowd and a popular thing to do. I know that our local Dobbies does a roaring trade in a more watered down version where we don’t get served but have to make our own choices. I can’t help thinking that being served is the whole point of enjoying the full experience. Someone asked me how I pronounced scone. It sounds simple at first glance, but apparently it divides nations. I pronounce mine sc-on where some people prefer sc-own. Perhaps there are other versions too, a bit like potatoes, potatos. There’s even a whole etiquette around afternoon tea in a posh place, so take note. I found the piece by William Hanson on the Gino and Mel entertaining but I obviously know very little about how to have afternoon tea in the old fashioned way. It’s a really good watch. The Telegraph outlines the history of how sitting for afternoon tea came about and it’s fascinating to read that it was a Duchess in the early 1800’s who felt hungry between meals and began to make a social occasion of a snack between main meals. It was a secret activity at first, it quickly became the norm and is still practised in all shapes and forms today as a formal ceremony between meals and to gather friends together. Nowadays, afternoon tea can be as simple as sitting at home with a friend or two and a mug of hot tea with home bakes, to the formal tea sittings in large hotels. The beauty of it is that afternoon tea can take whatever form we want it to, but it is nice to be served by staff in a crisp and smart uniform. Afternoon tea for me recently has mainly been sitting at a kitchen table with a friend or two, putting the world to rights while our kids are at school. I think the biggest question for most with English tea has to be how to add the milk and sugar. I’m a teapot or teabag gal with no sugar, and milk put in the cup last. My mother is a teabag lady and prefers her milk in the bottom of the cup with the tea poured on top. I understand that with teapot tea, but with teabag tea, the tea masks in the cup and I think the milk in first would interfere with that. Perhaps afternoon tea should be on my agenda more. Brought to you in collaboration with Hotel Direct. I do love afternoon tea. It’s a real treat. You’re right though, it’s a meal in itself.